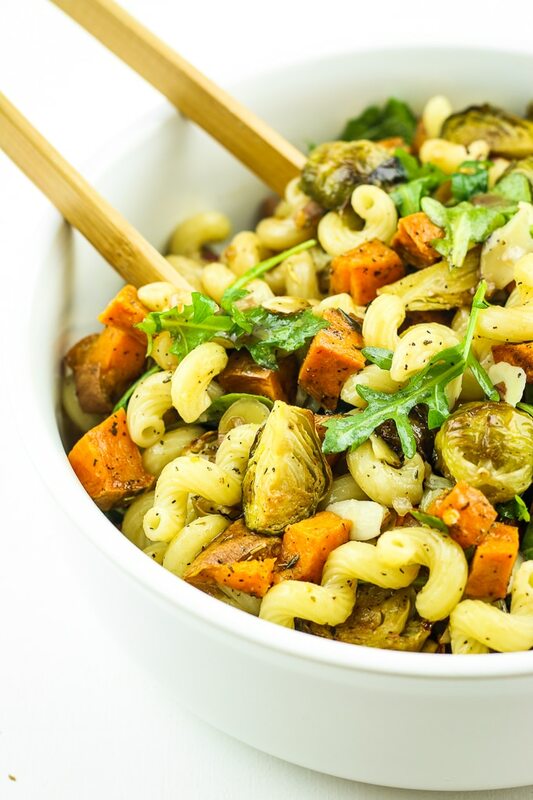 This Vegan Fall Pasta Salad with Brussels Sprouts and Sweet Potatoes is the perfect vegan side dish for any occasion. 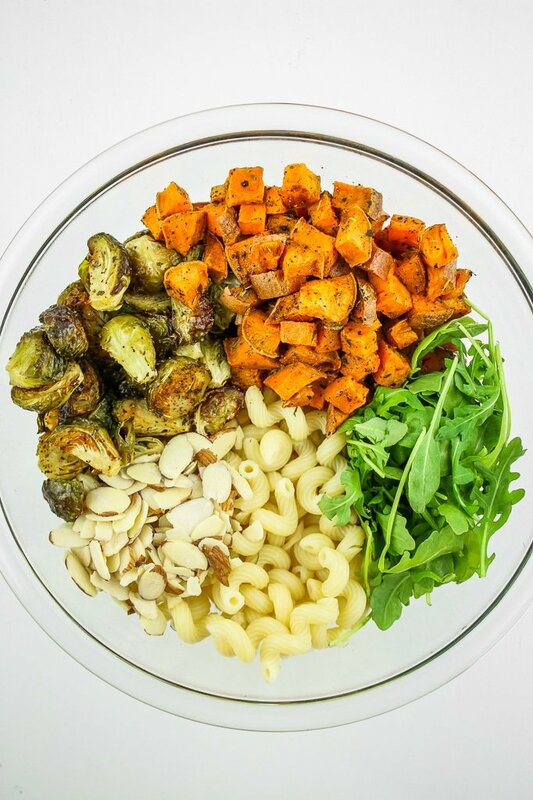 Roasted veggies, spicy arugula, and crunchy almonds are fall flavor heaven! This is a great vegan Thanksgiving side! Raise your hand if you love roasted veggies. Raise your other hand if you love pasta. Double high five! 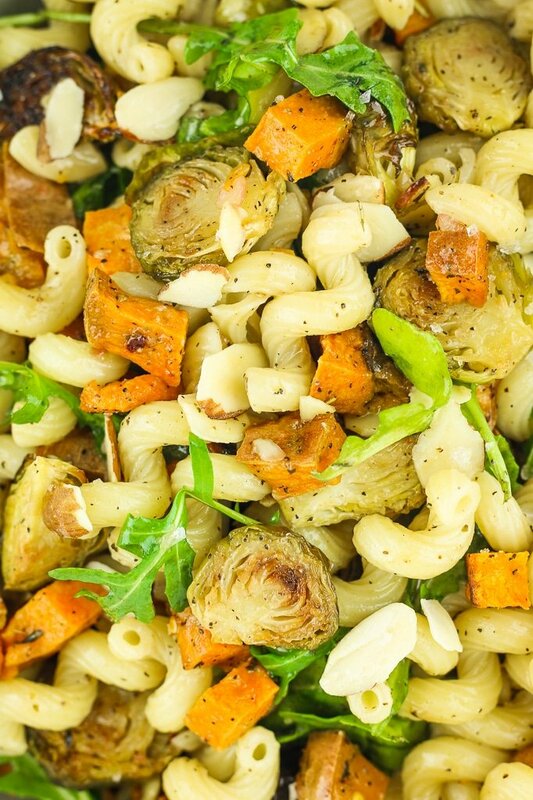  This is a fall pasta salad WITH roasted veggies. My two favorite veggies, to be exact. Brussels sprouts and sweet potatoes together? This is a dream come true. We made this recipe just before the weekend and I am SO glad we did. We went to my cousin’s wedding (congrats Lucas and Diana!!!) on Saturday and stayed the night in Indianapolis. On Sunday, we came home and spent most of the day re-hydrating, cleaning, and unpacking. Cooking was so NOT going to happen. Instead, we just scooped ourselves a couple of bowls of pasta salad and vegged out on the couch with a Halloween movie. Perfect for Thanksgiving. Perfect for cookouts. Perfect for lazy nights at home. Perfect all the way around. 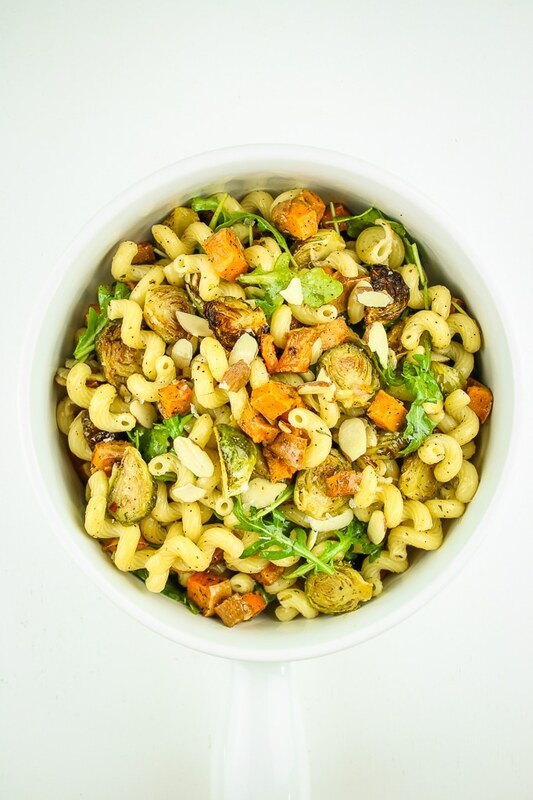 This pasta salad recipe is so versatile – you can customize it any way you want! Use a different type of pasta. Sub the sweet potato for roasted butternut squash or beets. Swap out almonds for pecans or walnuts. Just like the other pasta salad that you guys love so much, this recipe can be whatever you want it to be! Preheat the oven to 375º and line two baking sheets with parchment paper. Spread brussels sprouts on one baking sheet and sweet potatoes on the other. Spray with olive oil and sprinkle with seasonings – salt, pepper, Italian herbs, and paprika. Stir to coat evenly. Bake for 25-30 minutes, removing halfway to flip/stir the veggies. While the veggies are in the oven, you can boil your pasta and make the dressing! Cook pasta, then drain and rinse in cool water. Allow it to drain completely, then set it aside for later. In a small mason jar, combine olive oil, balsamic vinegar, shallot, sea salt, black pepper, and red pepper flakes. Shake until well combined. Once the veggies are done cooking, remove from the oven and allow to cool. 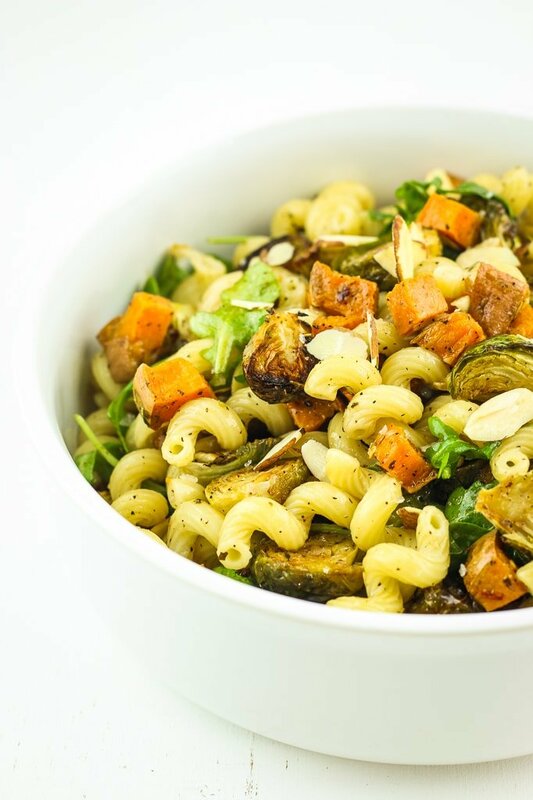 In a large bowl, combine pasta, brussels sprouts, sweet potatoes, arugula, and almonds. Pour dressing over top and stir until everything is evenly coated. Welcome to The Fitchen! What’s The Fitchen, you ask? It’s a food blog where we share the healthy, simple recipes that help us (and you!) stay fit in the kitchen. Here, you’ll find mostly plant-based and gluten-free recipes. Who are we, you ask? 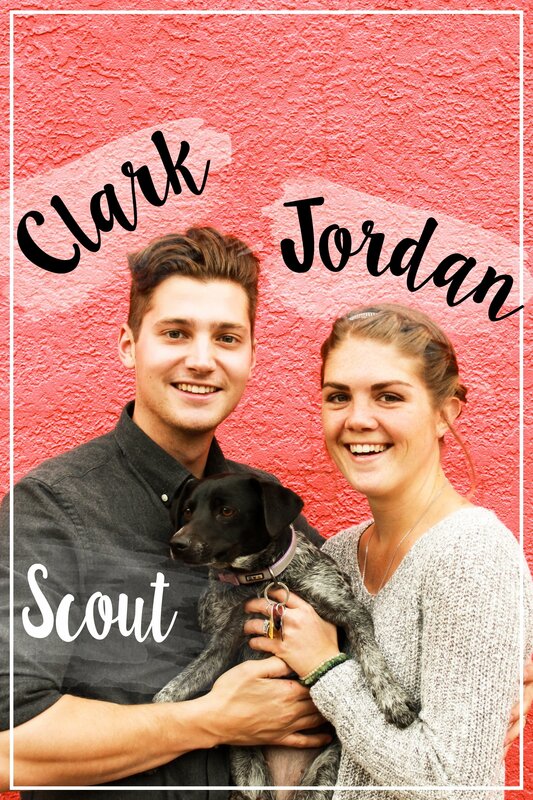 We are Jordan and Clark Cord (and Scout!). We’re passionate about real, whole foods and their power to fuel the body. We currently reside in Indiana where we balance our time between cooking and doing new projects on our first home! Copyright © 2012 - 2019 | The Fitchen, LLC. All Rights Reserved.